Nahal Haredi sergeant killed in Givat Assaf terror attack Thursday laid to rest at Ashkelon military cemetery. 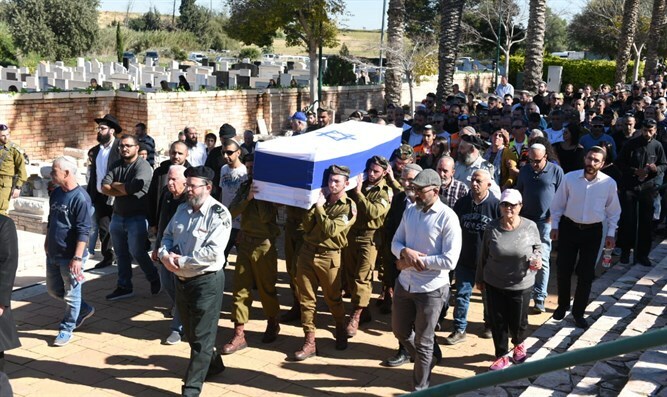 IDF Sergeant Yuval Mor-Yosef, who had served in the IDF’s Netzah Yehuda (Nahal Haredi) Battalion, was laid to rest Friday morning at the army cemetery in the coastal city of Ashkelon. Mor-Yosef, along with Corporal Yosef Cohen, was murdered by Hamas terrorists during a shooting attack near Givat Assaf, north of Jerusalem, Thursday. Two other Israelis, including a civilian and an IDF soldier, were seriously wounded in the attack. “Your friends have eulogized you, remembering you as a very special person, humble, quiet, and with a big heart,” said Kfir Brigade commander Colonel Tzion Ratzon at the funeral. Earlier on Friday, Corporal Yosef Cohen was laid to rest in Jerusalem’s Mount of Olives cemetery.